The YieldCo model is not broken. But investor expectations have changed. The YieldCo bubble popped almost exactly a year ago after a virtuous cycle turned vicious. Last May, I explained how these public companies (which own solar farms, wind farms and similar assets) could grow their dividends at double-digit rates despite no internal growth or retained earnings. This “weird trick” can work so long as the YieldCo’s stock price is rising, allowing it to sell stock at higher valuations and increase the amount of money invested per share. As long as investors expected dividends to continue to rise rapidly, they fed this virtuous cycle by bidding the stock price up, which in turn increased the expected dividend growth. Many YieldCos increased their dividend increase projections in 2014 and early 2015, when the bubble was at its height. Then the YieldCos got greedy. In the spring of 2015, new YieldCo IPOs and secondary offerings reached a crescendo, with every YieldCo raising new money over a three-month period. There were two IPOS: 8point3 Energy Partners’ (CAFD) for $420 million in June and TerraForm Global (GLBL) for $675 million in July. 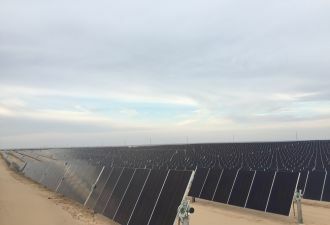 In addition, TransAlta Renewables (TSX:RNW) raised $226 million in April; Abengoa (now Atlantica) Yield (ABY) raised $670 million in May; NextEra Energy Partners (NEP) raised $109 million in May; NRG Yield (NYLD) raised $540 million in June; Hannon Armstrong (HASI) raised $18 million in June; TerraForm Power (TERP) raised $689 million in June; and Pattern Energy Group (PEGI) raised $225 million in July. Before that flurry of new offerings, the existing seven YieldCos had raised only $12.5 billion in total capital. The additional $3.5 billion flooded the market and halted the rise of most stocks. Investors began to scale back their estimates of future dividend increases accordingly. Lower dividend estimates led to lower demand for the stocks, even lower stock prices, and the cycle began to feed on itself in reverse. Over the next few months, the departing tide of YieldCo shares deprived sponsors of an important source of cheap finance for over-leveraged business models. It soon became clear which sponsors had been swimming naked: SunEdison (SUNEQ) and Abengoa (ABGB). SunEdison’s downfall in particular led many to ask if the YieldCo model is broken. Reporters (not to mention investors) have asked me this question on multiple occasions. My answer has always been "No -- except..."
The exception is the double-digit dividend per share growth that YieldCos led investors to expect during the bubble. With the YieldCo bust in the rearview mirror, I don’t think that investors are likely to bid up stock prices to the point where YieldCos can restart the virtuous cycle of secondary offerings at higher and higher prices feeding back to rapid dividend increases. What isn’t broken is the idea of funding clean energy projects with (relatively) cheap stock market capital. When YieldCo stocks were near their bottom, solar and wind developers were openly talking about private equity being a more cost-effective form of capital than the public markets and YieldCos. That situation is inherently unsustainable. The liquidity, better information, and broader spectrum of participants in the public markets ensure that private capital will not remain cheaper than public equity permanently. Private\-market participants have the ability to operate in public markets as well. When the prices are better in the public markets, that is where they will go. The opposite is not true for most public market investors: Regulations, lack of knowledge, and the need for liquidity keep them in publicly traded stocks and bonds, even when the returns are better elsewhere. It was only investor hesitancy in the wake of a crash that kept YieldCo stock prices so low for as long as it did. Now YieldCo prices are rising, and these entities can once again think about raising new equity on reasonable terms. While clouds of uncertainty remain over the TerraForms because of SunEdison’s bankruptcy, other YieldCo stocks have begun to recover, and many are returning to the capital markets to issue new equity. The strongest (and lowest yielding) YieldCo, NextEra Energy Partners, announced an “At The Market” -- or ATM program -- to sell small amounts of equity during its third-quarter 2015 conference call. Subsequently, NEP raised $26 million in the fourth quarter and approximately $40 million in the first quarter by issuing equity via the ATM. It also closed a $252 million secondary offering in the first quarter. Toronto-listed YieldCo TransAlta Renewables has also returned to the capital markets by selling CAN $172 million of new equity in December. 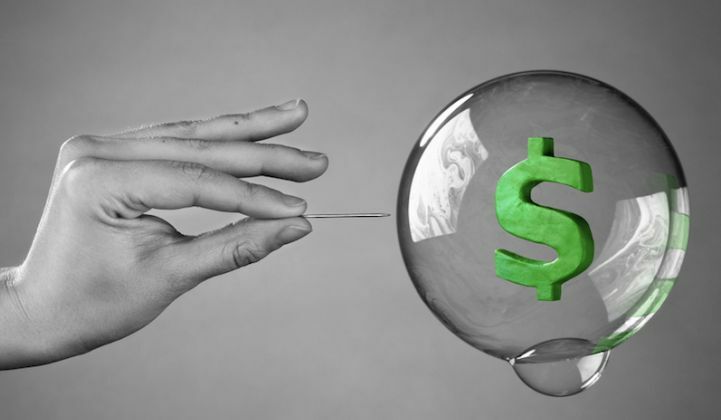 Unlike American YieldCos, it never promised double-digit dividend growth, did not see its stock price spike during the bubble, and did not suffer a severe decline when the bubble burst. What decline it did see has now been completely erased by its recent stock rally. In their first-quarter conference calls, both Pattern Energy Group and Hannon Armstrong put ATM sales agreements in place to enable more flexibility depending on market conditions. "We view this ATM as one tool in a broader toolkit, and we intend to use it judiciously for future project-related investments that are accretive and other corporate purposes. Again, to be clear, we do not plan on issuing under the ATM at this time, and at the current stock price. The ATM is only an option for the future," said Pattern CEO Mike Garland. Clearly, neither Hannon nor Pattern is planning on issuing large amounts of equity with this mechanism. But it's a positive signal that they are getting ready to tap the public equity markets. Most YieldCos have rallied significantly from their post-bubble lows, but are still far below their highs a year ago. This recovery has allowed several to once again begin to tap the markets for new equity, an early sign of the return to normalcy. Because of the YieldCos’ lower share prices and the relatively small size of these new equity offerings, they will not increase the investable funds per share nearly as much as previous offerings. Hence, despite better prices available for the clean energy assets YieldCos buy, the investments made with the funds will have more modest effects on the YieldCos’ dividends per share. YieldCos are returning to normalcy. We are no longer in the bubble. Disclosure: Tom Konrad manages and has a stake in the Green Global Equity Income Portfolio (GGEIP), a private fund which invests in YieldCos and other high-income green stocks. GGEIP holdings currently include CAFD, GLBL,TSX:RNW, ABY, NYLD/A, HASI, TERP and PEGI.